Do we got a buyer? 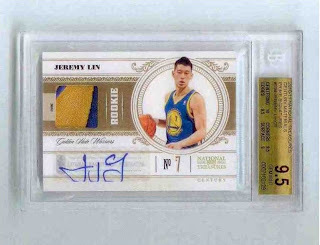 Two days before Jeremy Lin torched the Lakers for 38 points in front of a sold-out Garden crowd, Yair Rozmaryn, a card collector from Manhattan, purchased a Jeremy Lin rookie card for $1,000. Fast forward to today, and the card is selling for $20,600 on Ebay. Talk about a sound investment. The question is, what will the selling price be for the card by the end of this season? What do you think? Has Lin's rookie card price peaked?